The EnGen Mutation Detection Kit provides reagents for detection of on-target genome editing events. In the first step, targeted regions from cells whose genomes were targeted (i.e. CRISPR/Cas9, TALENs, Zinc-finger Nucleases) are amplified using Q5 Hot Start High-Fidelity 2X Master Mix. Upon denaturation and re-annealing, heteroduplexes are formed when mutations from insertions and deletions (indels) are present in the amplicon pool. 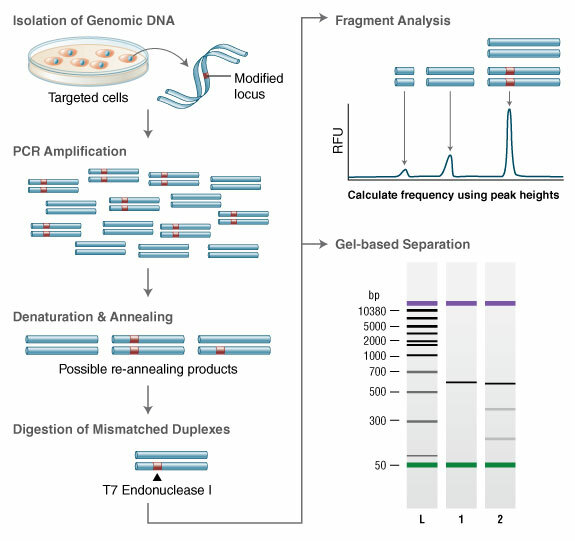 In the second step, annealed PCR products are digested with EnGen T7 Endonuclease I, a structure-specific enzyme that will recognize mismatches larger than 1 base. Both strands of the DNA are cut when a mismatch is present, which results in the formation of smaller fragments. Analysis of the resulting fragments provides an estimate of the efficiency of the genome editing experiments. The EnGen Mutation Detection Kit includes a Control Template and Primer Mix that can be used as a control for the PCR reaction and T7 Endonuclease I digestion. The Control Template and Primer Mix provided contains two plasmids and primers that when amplified, denatured and re-annealed will form heteroduplexes that contain a 10-base insertion. This structure is a substrate for T7 Endonuclease I. The digestion of the 600 bp heteroduplex containing amplicon yields products of 200 bp and 400 bp. 600 bp parental homoduplexes are uncleaved, and are easily distinguished from cleaved heteroduplexes when separated and visualized by agarose gel electrophoresis or fragment analysis instrument. The protocol has been optimized so that PCR products generated by the Q5 Hot Start High-Fidelity 2X Master Mix can be introduced directly into the T7 Endonuclease I digestion without the need for purification. Digestion of the heteroduplex is complete in only 15 minutes, and Proteinase K is included to stop the reaction efficiently. Additional Q5 Hot Start High-Fidelity 2X Master Mix is also included to allow for optimization of target site amplification before digestion. Genomic DNA is amplified with primers bracketing the modified locus. PCR products are then denatured and re-annealed yielding three classes of possible structures. Duplexes containing a mismatch greater than one base are digested by T7 Endonuclease I. The DNA is then electrophoretically separated and fragment analysis is used to estimate targeting efficiency. Why do I see an extra band when I run the undigested heteroduplex on an agarose gel? Why do I see very little DNA on my gel or low signal on the fragment analyzer? Will EnGen® T7 Endonuclease I recognize single base mismatches and single base insertions or deletions (indels)? Can cell lysates be used in the PCR reaction? What are the expected results using the included control? My PCR reaction yield is low, can I add more than 5 µl of the PCR reaction to the digestion reaction?